Is it not 8/17 right now? Heck yeah, been waiting for this debut since the commercials started airing. The stuff they’re making definitely reminded me of Junkyard Wars. I hope I speak for others when I say, Science Channel? I’m sure it may have more science than the history you’ll find on The History Channel. I would love to watch the trailer, but it will not save. I am on dialup, in 50 years maybe we will have real interney in rural wyoming. have you looked in to cell internet or satellite internet its way better than dial up but the sat has a cap 5g i think and cell dose to unless you get unlimited a bit more$$$$$$$$. better than an hour trying to watch 20 sec clip. you could also try shotgunning your modems and get two phone line put in your house and a second dial number and modem for your computer. Hughes Net has a 200 megabyte download daily limit before you get knocked down to slower-than-dialup speeds. You read that right 200 MEGABYTE. I browse a few pages then call it quits for the day. Never go with internet. Stay with dialup. It is not worth the price…I suppose it maybe worth it if dialup is not even available…but if you lived some place like that, I would guess internet would not really be a priority. Cell coverage in states like WY, ND, SD, MT is pretty much limited to major cities, towns and along major highways, the rest is static. Some rural telecomms still use telephone poles. and it is far too costly to expect DSL repeaters every 5 miles or whatever. All this sounds crazy… i even have a 1GB limit on my 3G got 10$ a month (would probably be 5$ in the states). Haven’t had dial up since 1998. Don’t get your hopes up … we’re talkin about TV here. Like every other piece of reality crap on television these days, I’m betting this will be produced/staged in order to appeal to the lowest common denominator of viewership. That said, I’ll still watch an episode or three. However, I’m guessing that a visit to the yard itself would be much more interesting and informative. my dad got out of it, but passed down the philosophy of “make it do something with stuff you already have” which is absolutely required in salvage hacking. I loved junkyard wars, then USA came along and fucked it up. yeah, I guess the networks feel they have to throw interpersonal tension into each episode to spice things up. It is wasted airtime of two people acting like jerks that turned me off to the Orange County Choppers show and the Boyd Coddington, Jessie James shows. Now Speed channel has two teams rebuilding a couple of junkers in 72 hours, and it has the same name-calling, arrogant personalities showing their ignorance. Junkyard Wars was the best, they even had Kryten for a host! One of my favorites was the T-Rex that ate brick walls and the football catapult that I KNEW wouldn’t work from the start. 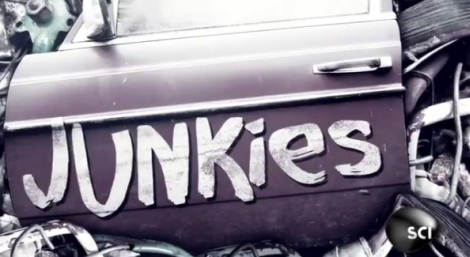 Yeah… I really miss Junkyard Wars. I hope this holds up, it’ll be great to have interesting “reality” TV for once! I have high hopes, but low expectations with regard to the longevity of it. Producers have to appeal to the greater audience, and hackers just aren’t typically a TV-watching majority. I’d love to see more hacker-iffic shows, but like many others before it they don’t last long. I’m happy to see more and more shows appearing on the streaming networks however – Revision3 has a couple, as well as others. Awe, accidentally reported this comment instead of replying.